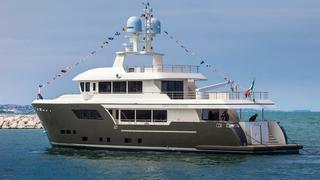 Italian yacht builder Cantiere delle Marche (CdM) has delivered its latest explorer yacht, the 31 metre Darwin Class 102 Acala. CdM reports the yacht is making her Atlantic crossing bound for a Central American client but will make her public debut during the Fort Lauderdale International Boat Show this November. Acala’s experienced owner’s previous yachts were delivered by Northern European yards. The hands-on owner closely collaborated with Cantiere delle Marche on Acala so his personality and usage of the yacht is tied into its design. Big boat customisations abound, from the dive centre in the lazarette that hosts a nitrox compressor to air conditioning in the outdoor living areas. The swim platform has been enlarged so Acala can accommodate two sizeable tenders – a six metre custom yacht tender by McMullen and Wing and another nearly five metre tender. Acala’s owner chose a five cabin layout with the owner’s stateroom set forward. Crew accommodations host up to seven crew members. The interior is artfully designed by famed South American designer Simon Hamui, who had worked with the yacht’s owner previously on some of his houses and offices. Hamui has carried forward the ceiling heights and wide open spaces found in the owner’s homes into his new yacht. CdM recently debuted its new flagship, Storm, at Cannes and announced it will be building an even larger yacht with the new Nauta Air 108.